Bullock Castle stands about two miles east of Dun Laoghaire harbour just above the shore of Dublin Bay Harbour on the road to Dalkey. It is thought to have been built by the Cistercian Monks of St. Mary's Abbey, Dublin, in order to protect their fishing rights. Following the suppression of the monasteries during King Henry VIII's reign it was leased to the Crown and later in the 16th Century it became the property of two brothers, Christopher and Richard Fagan, both of whom became Lord Mayors of Dublin. The ruined tower to the left of the composition was a watch tower or defence in the curtain wall which extends to the right of the picture, which was built to protect the small harbour which could originally be reached only through an arch in the castle which still exists. The two storey pedimented house in front of the castle was built in the first half of the 18th Century, remodelled or rebuilt in the 19th Century, and demolished in the 1980s. The tower which was shown in ordnance survey maps of 1837 was demolished circa 1850. The castle itself, which has been restored, now forms part of Our Lady's Manor Nursing Home. In the background of the picture can also be seen Martello tower number 11 (South Dublin), Sandycove Point, one of the many built circa 1804-5 in order to defend Dublin from the possibility of invasion by the French under Napoleon Bonaparte. This tower is probably the most famous Martello tower in Ireland because of its brief association with the author James Joyce, and provided the setting for the opening scene in Joyces's masterpiece Ulysses. It has been restored and extended as a museum devoted to Joyce. An earlier version of this composition, of slightly larger format (33.5 x 47.5 cm. 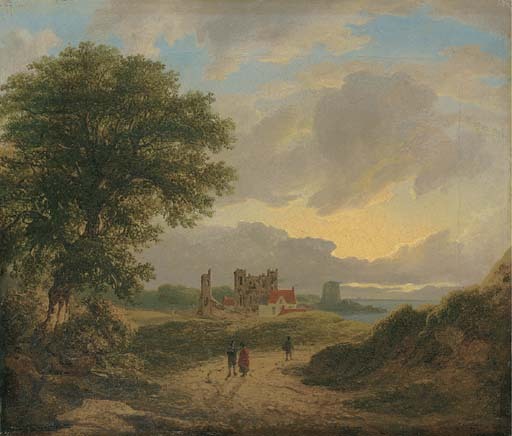 ), signed and dated 1819, first recorded in the collection of Dr. William L. Cremin, was exhibited in the Centenary exhibition of James Arthur O'Connor's work held at the Municipal Gallery of Modern Art in Dublin in 1941 (no. 14) and was more recently with the Gorry Gallery in Dublin (see entry by David Griffin, Director Irish Architectural Archive, Gorry Gallery exhibition catalogue, 2-10 November 2000, no. 7).